You will be able to know about Which is the Fastest Processor (Qualcomm Snapdragon 8150 SoC Vs Apple’s A12 Bionic Vs Huawei Kirin 980). Today we are here with Detail guide on Qualcomm Snapdragon 8150 SoC. Qualcomm is all set to unveil its latest mobile flagship processor chip. Qualcomm unveils the Snapdragon 8150 SoC, successor to last year’s Snapdragon 845. The Adreno 640 is expected to accompany the Snapdragon 8150 as the graphics chip. At least that what it looks like in leaked AnTuTu benchmarks posted in a Weibo chat and spotted by WWFCtech. The benchmarks for the overall performance show the Snapdragon 8150 scoring 362,292 which blows the Kirin 980′s score of 273,913 out of the water .and pulls slightly ahead of the A12 Bionic’s 353,210, according to GSMArena‘s benchmarks. According to a report by PCPop, the upcoming Snapdragon 8150 SoC will adopt a “large, medium, and small core architecture design” that consists of 2 super large cores, 2 large cores, and 4 small cores. Overall performance is said to increase by about 30 percent, over the Snapdragon 845, but we shall have to wait till the announcement to see what Qualcomm details as the improvement in its new flagship mobile SoC. The theme of the event invites “Dare to be the first 5G mobile experience” more than hints towards the presence of 5G capabilities in the Snapdragon 8150 SoC. 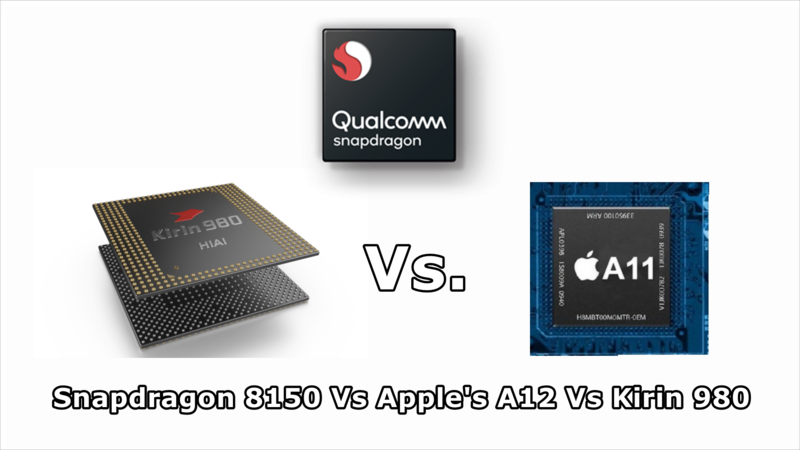 Qualcomm Snapdragon 8150 SoC Vs Apple’s A12 Bionic Vs Huawei Kirin 980: Which is the Fastest. If you have any problem then ask in the comment box. We can solve your problem.